Stuff happens. With so much information coming at us all the time, it’s hard to avoid bad news. Whether something bad happens to you personally or you hear about something bad happening elsewhere from the news, it can take a serious toll. But we’re resilient creatures with a wonderful ability to heal our wounds — physical or otherwise. However, we seem to forget this every so often. 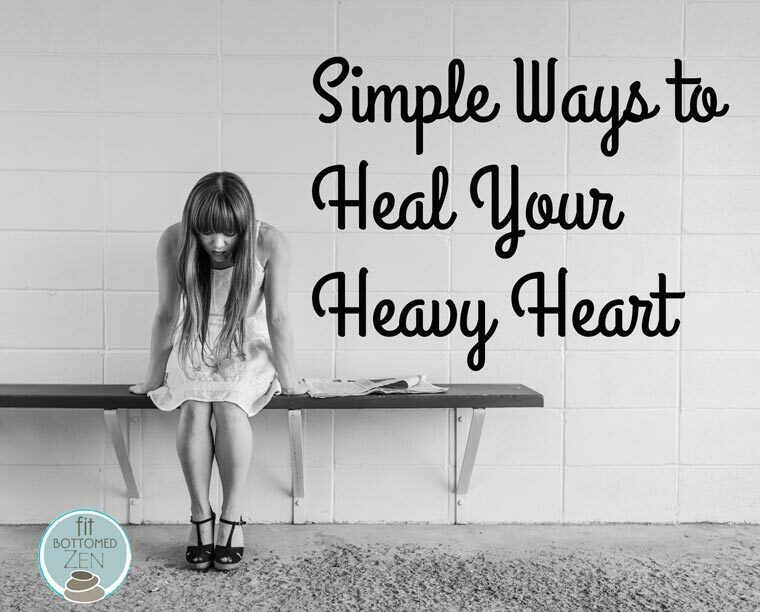 So here’s a few simple things you can do when you find that your heart is feeling heavy. 1. Open your eyes. When things go wrong, it becomes really easy to fixate on the negative, redirecting all our focus and energy on feeling hurt, confused and lost — this isn’t a place where we want to hang out for long. Awareness that your mind has become one-tracked is the first step. From there, you can make a conscious choice to broaden your field of vision. Every time you recognize that you’re only dwelling in the negative, make time for gratitude. Grab a sticky note and write down three things in your life that you’re grateful for and post it somewhere you can’t avoid looking. Sometimes all we need is a simple reminder that things in your world aren’t all bad in order to shift perspective. 2. Go outside. Nature is a powerful healer. When it feels like the walls are closing in on you, there’s something so comforting about seeing the world outside continue to turn uninterrupted. Being outside also causes us to breathe deeper and step outside our own heads to experience the all the magic that exists around us. Walk barefoot in the grass, lie on a blanket and watch the clouds float by or just soak up the light of the sun. Know that — just like everything in nature — there’s a season for everything and each season passes. 3. Move your body. We’re so much more than our thoughts and emotions. When our headspace gets overwhelmed, we tend to forget that our bodies — the home of our souls — need general maintenance and upkeep. Often, we start feeling lethargic and weak. Moving your body will remind you of your own strength, allowing you to see that you have the ability to move through any challenge that comes to you. More importantly, consider that emotions and thoughts can show up in the body in the form of either tension or numbness, contributing to feelings of stuckness. Physical activity can get the blood flowing again to all the tissues of the body and shake loose any tightness that may be building up. 4. Change your posture. Pay attention to how you’re standing or sitting. When our hearts hurt, our shoulders have a tendency to migrate forward into a rounded position — as if trying to protect the fragile heart space. This poor posture wreaks all sorts of havoc on the neck and back. Tension and muscular fatigue will only amplify the feelings you’re experiencing and then transfer that negative mental energy to your physical body as well. Check yourself from time to time and commit to sitting or standing tall whenever you catch yourself closing off and slumping forward. 5. Just breathe. Sorrow changes us and the first place it shows up is in the breath. We, as humans, have the ability to breathe both involuntarily and voluntarily — meaning that we don’t have to remember to take a breath because it happens automatically, but we can also consciously choose the take a breath whenever we want. When emotions hit us hard, the breath becomes shallow and quick. If we don’t do something about it, it’ll stay that way and prolong the body’s stress response. Sometimes we’ve just got to hit the manual override button and consciously choose to breathe deep into our bellies and slow it down. This one step alone can save you a ton of grief — literally and figuratively. 6. Stay present. Right now is all we really have. Recognize when you’re dwelling in the past and acknowledge that you’re relying on only a small portion of the actual experience — memories are only the version that the mind stored away and therefore aren’t necessarily accurate or complete. Notice when you’re getting ahead of yourself and projecting into the future and acknowledge that the future isn’t yet written. Close your eyes and tune into the beating of your heart, the sound of your breath and subtle vibrations of your body — hang out with yourself in the now and recognize that you have what you need to get through this moment … and the next.